Those with a passion for shoes often develop a love of browns in various hues – tan, chocolate, chestnut, oak. They also search for unusual colours and textures – red (oxblood) and green (olive), cordovan and crocodile. Black calf can just seem so dull. Particularly if this lover of shoes works in an office, or has done in the past. Black leather Oxfords may well be associated with the dull, conservative middle management of such offices (men who probably have one pair of shoes they beat into the ground every day of the year, and then complain when they fall apart). The shoe lovers are, of course, wrong. Black calf can be very exciting, as hopefully illustrated by my recent post on George Cleverley bespoke (my ‘dead man’s shoes’, as one colleague wittily calls them). But there’s nothing to be done about associations. Only so much of style and taste is rational. So for those who find black leather shoes boring, but probably need at least one pair for formal work occasions, not to mention funerals and black tie, I recommend a black suede/calf galosh shoe. From the turn of the century until the 1940s, much of man’s formal footwear was of this type. A fairly normal looking black oxford or slip-on in the bottom half, but a grey suede or cloth boot in the upper half. The suede, often buttoned across the foot, would make a shoe generally more flexible and instantly comfortable. The higher rise would also protect the foot and ankle from fairly muddy streets. The illustration from John Lobb bespoke above shows variations on this boot. These are lace-ups rather than buttons. 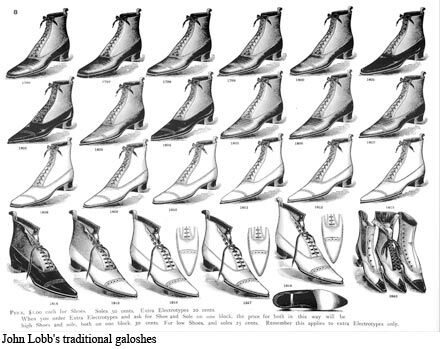 In the early days, the top halves would actually be separate spats in linen or boxcloth. Will over at A Suitable Wardrobe commissioned Gaziano & Girling to make a modern equivalent, dropping the boot height of the shoes and just making the upper half of a normal Oxford in grey suede. While I like this look, it is a little too showy for what I had in mind. 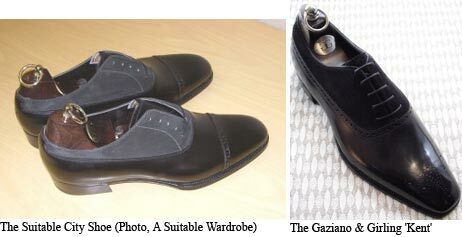 Instead, I would recommend to you the Gaziano & Girling Kent design itself, as seen on the firm’s website and shown here. The black suede is unusual but not instantly obvious. It is subtle yet sophisticated, a throw-back to traditional menswear with a modern application. Most bespoke shoemakers will make you something of this type, with the top of the galosh either contrasting calf or suede. 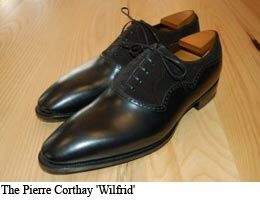 But the best ready-to-wear options are probably G&G or Pierre Corthay – any eagle-eyed readers will notice that my Corthays are of this type (the Wilfrid) but in tan. They also come in black. That’s the traditional, modern, city shoe. You can follow the discussion on The Galosh: A traditional, modern city shoe by entering your email address in the box below. You will then receive an email every time a new comment is added. These will also contain a link to a page where you can stop the alerts, and remove all of your related data from the site. I recently bought a pair of shoes from Tim Little on the Kings Road – very comfortable, but not cheap. He makes a shoe that is similar to the Corthay you have a picture of, but sadly it is not on his website. It was a thing of beauty, but at 390 pounds, not one I could afford to try on! I have recently moved to New York, from London, where the snow and icy weather make looking elegant while walking around quite tricky. Walking boots are ugly, I don’t even need to mention why wellingtons are not an option, and trainers or casual shoes with a business suit to and from work (leaving shoes in the office) just feels wrong. Wearing good quality leather shoes on the walk to the office means sacrificing a lot of time cleaning salt off them, and even more fretting about whether or not I am ruining them. I think if you are facing genuine ice and slush in New York, you will probably have to resort to rubber overshoes. These don’t look particularly elegant but will always look better than trainers or wellies. The other mitigating steps you could take would be to wear Cordovan shoes (which are more water-resistant), rubber soles or high boots. Search for Cordovan on the site A Suitable Wardrobe and you will find a good example. Thanks for the tip on Tim Little.